Articles researched, compiled and written by Madhu Nimkar about history of India.The content is copyrighted to Madhu Nimkar and may not be reproduced on other websites or blogs without prior permission.ALL RIGHTS RESERVED. Indo-Greek Kingdom or Greco-Indian Kingdom was ruled by more than 30 Hellenistic kings at the various parts of the northwest and northern Indian subcontinent during a period from the 2nd century BCE to the beginning of the 1st century CE. They were often in conflict with each other. The Greco-Bactrian king Demetrius invaded India early in the second century BC; and formed the kingdom, in this context at the boundary of India. There were numerous cities, such as Taxila, Pakistan's Punjab, or Pushkalavati, Sagala and a number of dynasties in their times based on Ptolemy's Geography and the nomenclature of later kings. 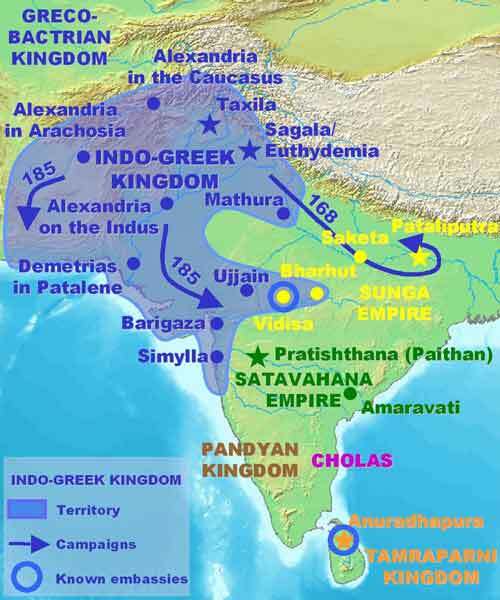 The Indo Greeks remained in India for two centuries (upto first century AD) and later paving the way for the Shakas (Scythians), Pahlavas (Parthians) and the Kushanas (Yuezhi). Demetrius, son of the Greco-Bactrian king Euthydemus I, led his troops across the Hindu Kush around 200 BCE when the invasion of northern India, and the establishment of "Indo-Greek kingdom" started. Apollodotus, may have made advances in the south, while Menander, led later invasions further east. The Bactrian king Euthydemus and his son Demetrius crossed the Hindu Kush and began the conquest of Northern Afghanistan and the Indus valley. For a short time, they wielded great power: a great Greek empire seemed to have arisen far in the East. But this empire was fallen off by internal argument and continual usurpations. When Demetrius advanced far into India one of his generals, Eucratides, made himself king of Bactria, and soon in every province there arose new usurpers, who proclaimed themselves kings and fought one against the other. Most of them were from Afghanistan, Pakistan and India and known only by their coins. By these wars, the dominant position of the Greeks was weakened even more quickly than would otherwise have been the case. After Demetrius and Eucratides, the kings abandoned the Attic standard of coinage and introduced a native standard, no doubt to gain support from outside the Greek minority. In India, Milinda/ Menander I the Indo-Greek king, converted to Buddhism. His successors managed to cling to power until the last known Indo-Greek ruler, a king named Strato II, who ruled in the Punjab region until around 55 BCE. However other sources place the end of Strato II's reign as late as 10 CE. Written evidence of the initial Greek invasion survives in the Greek writings of Strabo and Justin and in Sanskrit in the records of Patanjali, Kālidāsa, and in the Yuga Purana, among others. Coins and architectural evidence also attest to the extent of the initial Greek campaign. They ruled for two centuries, combined the Greek and Indian languages and symbols which can be seen on their coins, and blended ancient Greek, Hindu and Buddhist religious practices, as seen in the archaeological remains of their cities. Various Indian records describe Yavana attacks on Mathura, Panchala, Saketa, and Pataliputra. The term Yavana is thought to be a transliteration of "Ionians" and is known to have designated Hellenistic Greeks (starting with the Edicts of Ashoka, where Ashoka writes about "the Yavana king Antiochus"), but may have sometimes referred to other foreigners as well after the 1st century AD. Patanjali, a grammarian and commentator on Panini around 150 BC, describes in the Mahābhāsya, the invasion in two examples using the imperfect tense of Sanskrit, denoting a recent event: "Arunad Yavanah Sāketam" and "Arunad Yavano Madhyamikām". Also the Brahmanical text of the Yuga Purana, which describes Indian historical events in the form of a prophecy, but is thought to be likely historical, relates the attack of the Indo-Greeks on the capital Pataliputra, a magnificent fortified city with 570 towers and 64 gates according to Megasthenes, and describes the ultimate destruction of the city's walls. After the Greco-Bactrians militarily occupied parts of northern India from around 180 BC, numerous instances of interaction between Greeks and Buddhism are recorded. Besides the worship of the Classical pantheon of the Greek deities found on the coins (Zeus, Herakles, Athena, Apollo), the Indo-Greeks were involved with local faiths, particularly with Buddhism, but also with Hinduism and Zoroastrianism. Another Indian text, the Stupavadana of Ksemendra, mentions in the form of a prophecy that Menander will build a stupa in Pataliputra. Plutarch also presents Menander as an example of benevolent rule, and explains that upon his death, the honour of sharing his remains was claimed by the various cities under his rule, and they were enshrined in "monuments" (μνημεία, probably stupas), in a parallel with the historic Buddha. In general, the art of the Indo-Greeks is poorly documented, and few works of art (apart from their coins and a few stone palettes) are directly attributed to them. The coinage of the Indo-Greeks however is generally considered as some of the most artistically brilliant of Antiquity. The Hellenistic heritage (Ai-Khanoum) and artistic proficiency of the Indo-Greek world would suggest a rich sculptural tradition as well, but traditionally very few sculptural remains have been attributed to them. On the contrary, most Gandharan Hellenistic works of art are usually attributed to the direct successors of the Indo-Greeks in India in 1st century AD, such as the nomadic Indo-Scythians, the Indo-Parthians and, in an already decadent state, the KushansIn general, Gandharan sculpture cannot be dated exactly, leaving the exact chronology open to interpretation. The possibility of a direct connection between the Indo-Greeks and Greco-Buddhist art has been reaffirmed recently as the dating of the rule of Indo-Greek kings has been extended to the first decades of the 1st century AD, with the reign of Strato II in the Punjab. Also, Foucher, Tarn, and more recently, Boardman, Bussagli and McEvilley have taken the view that some of the most purely Hellenistic works of northwestern India and Afghanistan, may actually be wrongly attributed to later centuries, and instead belong to a period one or two centuries earlier, to the time of the Indo-Greeks in the 2nd-1st century BC. This also seems to be corroborated by Ranajit Pal's suggestion that the Indo-Greek king Diodotus I was the great Ashoka. Afghanistan, an area which "might indeed be the cradle of incipient Buddhist sculpture in Indo-Greek style" Referring to one of the Buddha triads in Hadda, in which the Buddha is sided by very Classical depictions of Herakles/Vajrapani and Tyche/Hariti, Boardman explains that both figures "might at first (and even second) glance, pass as, say, from Asia Minor or Syria of the first or second century BC (...) these are essentially Greek figures, executed by artists fully conversant with far more than the externals of the Classical style". Alternatively, it has been suggested that these works of art may have been executed by itinerant Greek artists during the time of maritime contacts with the West from the 1st to the 3rd century AD. The Greco-Buddhist art of Gandhara, beyond the omnipresence of Greek style and stylistic elements which might be simply considered as an enduring artistic tradition, offers numerous depictions of people in Greek Classical realistic style, attitudes and fashion (clothes such as the chiton and the himation, similar in form and style to the 2nd century BC Greco-Bactrian statues of Ai-Khanoum, hairstyle), holding contraptions which are characteristic of Greek culture (amphoras, "kantaros" Greek drinking cups), in situations which can range from festive (such as Bacchanalian scenes) to Buddhist-devotional. Uncertainties in dating make it unclear whether these works of art actually depict Greeks of the period of Indo-Greek rule up to the 1st century BC, or remaining Greek communities under the rule of the Indo-Parthians or Kushans in the 1st and 2nd century AD. Benjamin Rowland thinks that the Indo-Greeks, rather than the Indo-Scythians or the Kushans, may have been the models for the Bodhisattva statues of Gandhara. It is also thought that Greeks contributed to the sculptural work of the Pillars of Ashoka and more generally to flourish the Mauryan art. Very little is known about the economy of the Indo-Greeks, although it seems to have been rather vibrant. The abundance of their coins would tend to suggest large mining operations, particularly in the mountainous area of the Hindu-Kush, and an important monetary economy. The Indo-Greek did strike bilingual coins both in the Greek "round" standard and in the Indian "square" standard, suggesting that monetary circulation extended to all parts of society. The adoption of Indo-Greek monetary conventions by neighbouring kingdoms, such as the Kunindas to the east and the Satavahanas to the south, would also suggest that Indo-Greek coins were used extensively for cross-border trade. An indirect testimony by the Chinese explorer Zhang Qian, who visited Bactria around 128 BC, suggests that intense trade with Southern China was going through northern India. Zhang Qian explains that he found Chinese products in the Bactrian markets, and that they were transiting through northwestern India, which he incidentally describes as a civilization similar to that of Bactria. Maritime relations across the Indian ocean started in the 3rd century BC, and further developed during the time of the Indo-Greeks together with their territorial expansion along the western coast of India. By the time Indo-Greek rule was ending, up to 120 ships were setting sail every year from Myos Hormos to India. The coins of the Indo-Greeks provide rich clues on their uniforms and weapons. Typical Hellenistic uniforms are depicted, with helmets being either round in the Greco-Bactrian style, or the flat kausia of the Macedonians (coins of Apollodotus I). Their weapons were spears, swords, longbow (on the coins of Agathokleia) and arrows. The recurve bow becomes a standard feature of Indo-Greek horsemen by 90 BC, as seen on some of the coins of Hermaeus. Generally, Indo-Greek kings are often represented riding horses, as early as the reign of Antimachus II around 160 BC. The equestrian tradition probably goes back to the Greco-Bactrians, who are said by Polybius to have faced a Seleucid invasion in 210 BC with 10,000 horsemen. War elephants never represented on their coins. • Kings who left many coins reigned long and prosperously. • Hoards which contain many coins of the same king come from his realm. • If a king overstrikes another king's coins, this is an important evidence to show that the overstriker reigned after the overstruck. Overstrikes may indicate that the two kings were enemies. • Indo-Greek coins, like other Hellenistic coins, have monograms in addition to their inscriptions. These are generally held to indicate a mint official; therefore, if two kings issue coins with the same monogram, they reigned in the same area, and if not immediately following one another, have no long interval between them. All of these arguments are arguments of probability, and have exceptions; one of Menander's coins was found in Wales. The exact time and progression of the Bactrian expansion into India is difficult to ascertain, but ancient authors name Demetrius, Apollodotus, and Menander as conquerors. The Arjunayanas (area of Mathura) and Yaudheyas mention military victories on their coins ("Victory of the Arjunayanas", "Victory of the Yaudheyas"). During the 1st century BC, the Trigartas, Audumbaras and finally the Kunindas also started to mint their own coins, usually in a style highly reminiscent of Indo-Greek coinage. It would also seem that some of the coins emitted by the Indo-Greek kings, particularly those in the monolingual Attic standard, may have been used to pay some form of tribute to the Yuezhi tribes north of the Hindu-Kush. This is indicated by the coins finds of the Qunduz hoard in northern Afghanistan, which have yielded quantities of Indo-Greek coins in the Hellenistic standard (Greek weights, Greek language), although none of the kings represented in the hoard are known to have ruled so far north. Conversely, none of these coins have ever been found south of the Hindu-Kush. While all Indo-Greek kings after Apollodotus I mainly issued bilingual (Greek and Kharoshti) coins for circulation in their own territories, several of them also struck rare Greek coins which have been found in Bactria. The later kings probably struck these coins as some kind of payment to the Scythian or Yuezhi tribes who now ruled there, though if as tribute or payment for mercenaries remains unknown. In 326 BC Alexander the Great conquered the northwestern part of the Indian subcontinent as far as the Hyphasis River, and established satrapies as well as several cities, such as Bucephala, until his troops refused to go further east. Also several Greeks, such as the historian Megasthenes, Deimachus and Dionysius, were sent to reside at the Mauryan court. On these occasions, Greek populations within Chandragupta's grandson Ashoka (Mauryans) realm also had converted to Buddhism. Again in 206 BC, the Seleucid emperor Antiochus led an army into India (Caucasus/Kush), where he received war elephants and presents from the king Sophagasenus. Alexander had also established several colonies in neighbouring Bactria, such as Alexandria on the Oxus (modern Ai-Khanoum) and Alexandria of the Caucasus (medieval Kapisa, modern Bagram). The death of Alexander gave rise to the kingdom of his general Seleucus Nicator who ruled parts of northern India. He was subsequently weakened in the Indian sub continent by the Maurya Empire. After Alexander's death in 323 BC, Bactria became a Satrapy of the Seleucid Empire. In 250 BC the Satrap Diodotus of Bactria rebelled against the Seleucids (Antiochus) and declared himself King of the Greco-Bactrian Kingdom. Antiochus was ignoring his territory in the Indian sub continent due to his concentration in the east Mediterranean region. Taking advantage, Diodotus set up his independent rule in Bactria. Later, another satrap, Euthydemus defeated the Diodotus’s son and founded the Euthydemid dynasty. His son Demetrius I (186-5 BC) led his Indo Greek armies to the south east of the Hindukush Mountains. Demetrius was followed by Agathocles (rule.190-180BC). He may have been a contemporary or successor of Panteleon (probably the younger brother of Demetrius), whom he replaced. He was in charge of Paropamisade (between Bactria and India). His throne was usurped by Eucratides, who pushed Agathocles back to Bactria and established his own lineage in Paropamisade. Then there was Antimachus I (185-170), probably a brother of Demetrius, who ruled Bactria and lower Kabul. Parts of his kingdom were probably annexed by Eucratides. Diodotus' son was overthrown by Euthydemus I/ Eucratides in 230 BC, who pushed Agathocles back to Bactria and established his own lineage in Paropamisade and founded the Euthydemid Dynasty. The Greco-Bactrians maintained a strong Hellenistic culture at the door of India during the rule of the Mauryan Empire in India, as exemplified by the archaeological site of Ai-Khanoum. The Greeks in Bactria (Greco-Bactrians) remained in close contact with the Greeks in the Mauryan Empire. When the Mauryan Empire was overthrown by the Sunga Dynasty around 185 BC, an army led by King Demetrius I of Bactria invaded India and seized the lands of the Kabul Valley. The Maurya Dynasty was overthrown around 185 BC when Pusyamitra Sunga, the commander-in-chief of Mauryan Imperial forces and a Brahmin, assassinated the last of the Mauryan emperors Brhadrata. Pusyamitra Sunga then ascended the throne and established the Sunga Empire, which extended its control as far west as the Punjab. Demetrius I was the son of Euthydemus I of Bactria; there is an inscription from his father's reign already officially hailing him as victorious. He also has one of the few absolute dates in Indo-Greek history: after his father held off Antiochus III for two years, 208-6 BC, the peace treaty included the offer of a marriage between Demetrius and Antiochus' daughter, Coins of Demetrius I have been found in Arachosia and in the Kabul Valley; the latter would be the first entry of the Greeks into India, as they defined it. There is also literary evidence for a campaign eastward against the Seres and the Phryni; but the order and dating of these conquests is uncertain. Demetrius I seem to have conquered the Kabul valley, Arachosia and perhaps Gandhara; he struck no Indian coins, so either his conquests did not penetrate that far into India or he died before he could consolidate them. On his coins, Demetrius I always carries the elephant-helmet worn by Alexander, which seems to be a token of his Indian conquests. Bopearachchi believes that Demetrius received the title of "King of India" following his victories south of the Hindu Kush. He was also given, though perhaps only posthumously, the title ανικητος ("Anicetos", lit. Invincible) a cult title of Heracles, which Alexander had assumed; the later Indo-Greek kings Lysias, Philoxenus, and Artemidorus also took it Finally, Demetrius may have been the founder of a newly discovered Greek Era, starting in 186/5 BC. After the death of Demetrius, the Bactrian kings Pantaleon and Agathocles (c. 185-170 BC) struck the first bilingual coins with Indian inscriptions found as Far East as Taxila. The Bactrian kingdom seems to have included Gandhara. Several Bactrian kings followed after Demetrius' death, and it seems likely that the civil wars between them made it possible for Apollodotus I (from c. 180/175 BC) to make himself independent as the first proper Indo-Greek king. He did not rule from Bactria. Pushed Agathocles back to Bactria and established his own lineage in Paropamisade. Large numbers of his coins have been found in India, and he seems to have reigned in Gandhara as well as western Punjab. Apollodotus I was succeeded by or ruled alongside Antimachus II (170BC), likely the son of the Bactrian king Antimachus I. He had fought with the usurper Eucratides. He ruled over the vast territory from Hindukush to Punjab. He is credited to the use of Tax receipts. The next important Indo-Greek king was Menander or Milinda (from c. 165/155 BC or c.155-130 BC) whose coins are frequently found even in eastern Punjab. Menander seems to have begun a second wave of conquests, and since he already ruled in India, it seems likely that the easternmost conquests were made by him. Menander's reign saw the end of the Indo-Greek expansion. Menander is considered to have been probably the most successful Indo-Greek king, and the conqueror of the largest territory. The finds of his coins are the most numerous and the most widespread of all the Indo-Greek kings. Menander is also remembered in Buddhist literature, where he called Milinda Milinda achieved fame due to the Buddhist text, ‘Milinda Panha’. It is an account of a long discussion conducted between Milinda and Nagasena, a Buddhist monk. This led to Milindas acceptance of Buddhism. Milinda also created a vast empire from central Afghanistan upto western and central India. 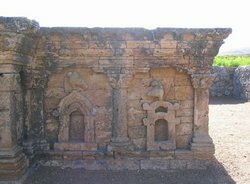 His capital remained Sakala (Sialkot). Milinda proved himself a patron of Buddhism and himself was a reputed scholar. He enjoyed tremendous popularity amongst his subjects. He also introduced a new coin type, with Athena Alkidemos ("Protector of the people") on the reverse, which was adopted by most of his successors in the East. The Indo-Greek states, shielded by the Hindu Kush range, were saved from the invasions, but the civil wars which had weakened the Greeks continued. Menander I, died around the same time, and even though the king himself seems to have been popular among his subjects, his dynasty was at least partially dethroned. Probable members of the dynasty of Menander include the ruling queen Agathokleia, her son Strato I, and Nicias, though it is uncertain whether they ruled directly after Menander. Other kings emerged, usually in the western part of the Indo-Greek realm, such as Zoilos I, Lysias, Antialcidas and Philoxenos. These rulers may have been relatives of either the Eucratid or the Euthydemid dynasties. There are however no historical recordings of events in the Indo-Greek kingdom after Menander's death around 130 BC, since the Indo-Greeks had now become very isolated from the rest of the Graeco-Roman world. The later history of the Indo-Greek states, which lasted to around the shift BC/AD, is reconstructed almost entirely from archaeological and numismatical analyses. After Milindas there were many kings, notably Zoilus I (130-120 BC- ruled Paropamisade/Arochosia, from the Euthydemus line). Lysias (120-110 BC) was a close successor of Zoilus , and claimed lineage from Demetrius I. There was a Strato I, son of the Indo Greek queen Agathokleia , also considered (disputed by some) the widow of Menander I (ruled from 120-110 BC in the areas of Gandhara and Punjab ) , probably a contemporary of Lysias . The important Bactrian king Eucratides seems to have attacked the Indo-Greek kingdom during the mid 2nd century BC. A Demetrius, called "King of the Indians", seems to have confronted Eucratides in a four month siege, reported by Justin, but he ultimately lost. In any case, Eucratides seems to have occupied territory as far as the Indus, between ca. 170 BC and 150 BC. His advances were ultimately checked by the Indo-Greek king Menander I. The Indo-Greek kingdom then divided into Parpamisade/Arachosia and Gandhara/ Punjab. Thus there were Antialcidas of Parapamisade and Heliocles of Gandhara (110-100 BC), Polyxenius of Parapamisade and Demetrius III (100 BC) of Gandhara. Again there was the king Philoxenus (100-95 BC) who ruled entire regions from Parpamisade to Punjab , Diomedes ruled Paropamisade and Amyntas ruled Afghanistan and Epander ruled Punjab (95-90 BC) , Theophilos of Parapamisade and Peukolas of Gandhara and Thraso (90 BC) ruled central and western Punjab, Nicias of Parapamisade and Menander II ruled Arachosia and Gandhara and Artemediros (r.90-85 BC), Hermaeus ruled Parapamisade and Archabios ruled Gandhara and Pushkalavati / Peshawar , between 90-70 BC. (He is also disputed by some as a son of Maues the Scythian king). From the mid-2nd century BC, the Scythians and then the Yuezhi, following a long migration from the border of China, started to invade Bactria from the north. Around 130 BC the last Greco-Bactrian king Heliocles was probably killed during the invasion and the Greco-Bactrian kingdom proper ceased to exist. The Parthians also probably played a role in the downfall of the Bactrian kingdom. Throughout the 1st century BC, the Indo-Greeks progressively lost ground to the Indians in the east, and the Scythians, the Yuezhi, and the Parthians in the West. About 20 Indo-Greek kings are known during this period, down to the last known Indo-Greek ruler, a king named Strato II. Scythian invasions (80 BC-20 AD) Around 80 BC, an Indo-Scythian king named Maues (85-60 BC), possibly a general in the service of the Indo-Greeks, ruled for a few years in northwestern India before the Indo-Greeks again took control. He conquered Taxila and established his kingdom in modern Pakistan. He seems to have been married to an Indo-Greek princess. Then again, there was the Indo Greek line continuing. Telephos ruled Gandhara (probably was an brief Indo greek successor to Maues), and Apollodotus II who belonged to the dynasty of Menander I (75-70 BC) ruled Punjab , Hippostratos ruled Punjab, Peshawar and Dionysios ruled east Punjab( 65-55 BC) , Zoilos II (55-35 BC) ruled east Punjab, Appolophanes(55-35) , Strato II (25-10) who ruled eastern Punjab. Strato II was the last Indo Greek king after being invaded by the Indo Scythian king Rajuvula of Mathura (Uttar Pradesh state). There is also a mention of Heliodorous who was either the king of Taxilla or the kings envoy. Heliodorous was a devotee of Lord Vasudeva ( or Vishnu - an primary Hindu God). Heliodorous erected a structure, ‘Garuda Dhwaja’ in the honour of Lord Vasudeva. Indo Greeks introduced a lot of innovations in the coins that they made. They used the technique of die striking in the manufacture of coins. Their coins had portraits of their rulers. King Hippostratos (65-55 BC) seems to have been one of the most successful subsequent Indo-Greek kings until he lost to the Indo-Scythian Azes I, who established an Indo-Scythian dynasty.Various coins seem to suggest that some sort of alliance may have taken place between the Indo-Greeks and the Scythians. Although the Indo-Scythians clearly ruled militarily and politically, they remained surprisingly respectful of Greek and Indian cultures. Their coins were minted in Greek mints, continued using proper Greek and Kharoshthi legends, and incorporated depictions of Greek deities, particularly Zeus. The Mathura lion capital inscription attests that they adopted the Buddhist faith, as do the depictions of deities forming the vitarka mudra on their coins. Greek communities, far from being exterminated, probably persisted under Indo-Scythian rule. The Indo-Greeks continued to rule a territory in the eastern Punjab, until the kingdom of the last Indo-Greek king Strato was taken over by the Indo-Scythian ruler Rajuvula around 10 AD. One of the last important kings in the Paropamisadae was Hermaeus (ruled 90-70 BC), who ruled until around 80 BC; soon after his death the Yuezhi or Sakas took over his areas from neighbouring Bactria. After the death of Hermaeus, the Yuezhi or Saka nomads became the new rulers of the Paropamisadae, and minted vast quantities of posthumous issues of Hermaeus up to around 40 AD, when they blend with the coinage of the Kushan king Kujula Kadphises. The first documented Yuezhi prince, Sapadbizes, ruled around 20 BC, and minted in Greek and in the same style as the western Indo-Greek kings, probably depending on Greek mints and celators. The later king Hippostratus may however also have held territories in the Paropamisadae. It is a wonderful blog, very impressively written, you can also find more information about history of india for your more knowledge.